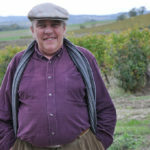 Jean-Luc Patard, originally from the Loire Valley, founded Le Petit Ecole de Vin in 1992 in Limoux. Over the years he has built up invaluable knowledgeand contacts in the area and commands respect from the winegrowers who work with him, for his knowledge of their work and his appreciation of their products. A part-time professional musician, he is known to treat our clients to Occitan singing in chapels and after dinner guitar playing. 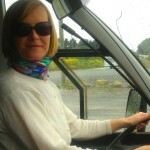 Alison Judge has been in the Aude for 15 years in the tourism sector and can be seen driving all over the region in vehicles ranging from 8 seater minibuses to luxury coaches. In fact the narrower the road the more she enjoys the experience! Her motivation is to show visitors not only varied dramatic landscapes but to meet the real actors in the area, whose hard work and passion mean that we are all able to share the in the top quality products this region has to offer. 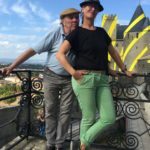 “We are now back in the UK after a ‘flying’ visit to Carcassonne.